But testimony from the National Restaurant Assn. makes the case that Oregon’s minimum wage increase actually hurt the state’s economy. That’s because, it says, the minimum wage forced employers to lay off workers — the average number of workers in Oregon’s restaurants has steadily declined from 16.4 workers per establishment in 1996 to 13.8 workers in 2011. Overall, U.S. restaurants employ an average of 16.9 workers per establishment, the same level as 1996. Anyway, back in the fall I was doing cross state comparisons for the Leisure and Hospitality industry for the Citizens’ Initiative Review Commission, in particular for the casino measure. They had asked how Oregon compared to other states and what I found was Oregon actually has more Leisure and Hospitality than other western states (except for Nevada, think Las Vegas) so when this appeared in the paper today, I was somewhat puzzled. 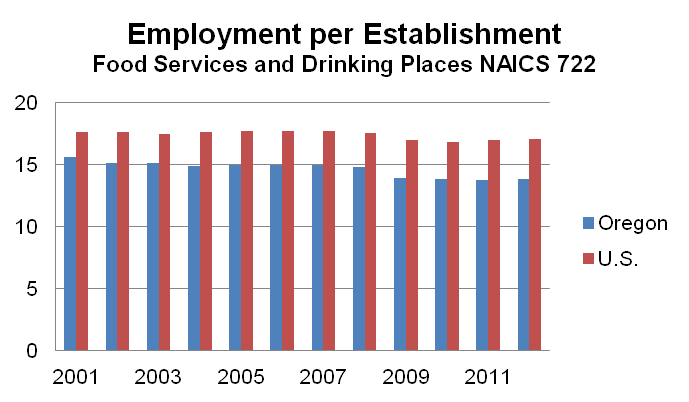 I went and downloaded the QCEW data for NAICS 722 – Food Services and Drinking Places which has employment, number of business establishment and wages. This includes both bars and restaurants however Oregon data for just restaurants in the QCEW is not available online except for 2011 and 2012 so to get a longer time series I’m using the broader category that includes bars. First, as seen below, yes, Oregon does have less employees per establishment than the national average. This verifies the claim above and it is technically accurate. However does that mean Oregon’s Leisure and Hospitality industry is in decline (and due to the minimum wage)? I would argue that Oregon is not under-served by the industry when looking not at the size of each individual establishment but the overall size of the industry relative to the population. 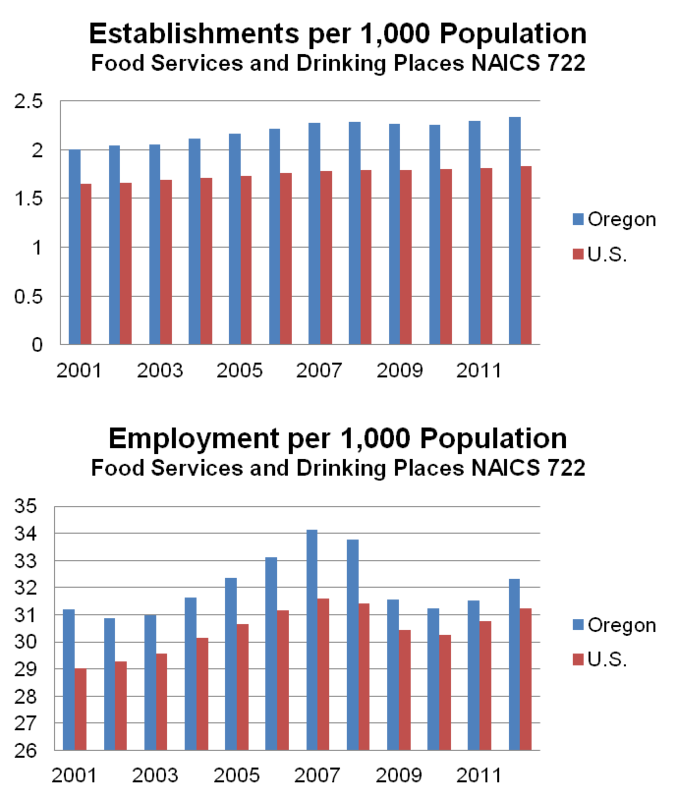 The graphs below show the number of establishments and total employment on a per 1,000 population basis. This gives the relative size of the industry to the base population of potential customers. It is here that you can see Oregon actually has more than the national average. This is the result I have in my head for the industry in Oregon. Possibly it has to do with our foodie culture, our brewpubs (although some of those are in beverage manufacturing, at least the brewery portion, if I’m not mistaken), and smaller, more abundant restaurants. And part of it may have to do with the minimum wage, in terms of scaling a business larger, although I’m not entirely sure why that may be the case but I wouldn’t rule it out categorically. Now what all of this means for actual business conditions and profitability, etc, I do not know. I just know that Oregon tends to have more and, yes, smaller eating and drinking establishments than the U.S. relative to our population. I am also not sure if this is good, bad, or indifferent, but simply arguing our smaller establishments are bad for the economy seems like the wrong way to go about talking about the subject. For more information on Oregon’ minimum wage here is an Employment Department blog post from last month and they have more articles on their website.